Background: Elderly patients are the fastest-growing group in need of renal transplantation. This study puts focus on renal transplant recipients in their 80th year or longer at time of engraftment. Is there evidence to support an absolute upper age limit for renal transplantation? Methods: Recipients in their 80th year or longer, transplanted between 1983 and 2015, were included. Data were retrieved from the Norwegian Renal Registry in the end of October 2015. Graft and patient survivals were compared with recipients aged 70 to 79 years at transplantation. Results: Forty-seven patients older than 79 years were transplanted in the defined period. Median age 80.1 years, 81% were men. Median time on dialysis before transplantation was 18.5 months. All patients received an allograft from a deceased donor (median donor age, 61.8 years). In the death-censored graft survival model, there was no statistical difference between the groups. We found improved patient and graft survivals after introduction of mycophenolate mofetil and induction with basiliximab. Patients transplanted before 2000 had increased risk of death compared with those transplanted after 2000 (hazard ratio, 3.2; 95% confidence interval, 1.2-8.7). Median uncensored graft survival for patients transplanted after the year 2000 was 5.0 year (95% confidence interval, 2.4-7.6). Median patient survival was 5.0 years (3.1-6.9) and 5-year patient survival was 55%. Conclusions: Age by itself should not be an absolute contraindication against renal transplantation. An estimated 5-year survival rate of 55% post-engraftment for an 80-year-old patient is in our opinion more than acceptable. Preapproval clinical trials examining the safety and efficacy of rosuvastatin demonstrated an increased incidence of proteinuria, hematuria, rhabdomyolysis, and other acute kidney injury of unknown cause at high doses. The latter cases manifested with urine sediment findings and in some cases, renal histology, indicating renal tubular injury in the absence of rhabdomyolysis. Despite these provocative findings, there have been very few reports in the literature regarding non−rhabdomyolysis-mediated acute kidney injury associated with high-dose rosuvastatin since its widespread introduction more than a decade ago, suggesting that it is either a rare entity or systematically underdiagnosed and under-reported. Background: Calcific uremic arteriolopathy (CUA), also referred to as calciphylaxis, is a rare and serious complication of kidney failure with limited treatment options. Kidney transplantation (KTX) restores kidney function and is hence a potential treatment option for CUA. We present 3 patients who had their CUA lesions successfully healed after urgent KTX. Methods: Data were retrospectively retrieved from hospital records at our national transplant center. Results: All 3 patients had previously been kidney transplanted and had experienced graft loss and were in stage 5 kidney failure when CUA developed. One patient was on warfarin treatment for pulmonary embolism. Skin lesions developed in the lower limbs in all 3 patients. Multidisciplinary care including intensified hemodialysis did not induce any clinically relevant improvement of the lesions. The recipients were enlisted on a clinically urgent waitlist for KTX and received a deceased donor kidney after 2 to 4 weeks. All recipients experienced good graft function. The lesions healed completely within 6 weeks in 2 patients. In the third patient, partial healing occurred after 2 months and complete healing was achieved 4 months after transplantation. Conclusions: These cases indicate that urgent KTX may contribute to an efficient treatment for end-stage renal disease patients with CUA. A 72-year-old woman with poorly controlled hyperlipidemia and diabetes presented to the emergency department with a 5-day history of lower abdominal pain. She also had fever and reported nausea and vomiting. Physical examination revealed lower abdominal tenderness. Blood tests revealed leukocytosis associated with a left shift (neutrophil count of 11,800 per cubic millimeter) and elevation of the levels of C-reactive protein (24.0 mg per deciliter) and glucose (735 mg per deciliter [41 mmol per liter]). A plain radiograph of the kidneys, ureters, and bladder showed air surrounding the bladder (Panel A, arrows). An abdominal computed tomographic scan revealed an area of gas dissecting the bladder wall, bilateral hydronephrosis, and intramural gas with a cobblestone or beaded-necklace appearance (Panel B, arrows), findings consistent with emphysematous cystitis. The patient was treated with broad-spectrum antimicrobial agents and placement of a Foley catheter. Subsequently, a urine culture was positive for Escherichia coli; the patient was treated with antibiotics and recovered uneventfully. Emphysematous cystitis is a urinary tract infection that is associated with gas formation and is commonly caused by E. coli and Klebsiella pneumoniae. by Wu, M., Gu, J., Mei, S., Xu, D., Jing, Y., Yao, Q., Chen, M., Yang, M., Chen, S., Yang, B., Qi, N., Hu, H., Wüthrich, R. P., Mei, C.
Inflammation plays an important role in polycystic kidney disease (PKD). The current study aimed to examine the efficacy of the anti-inflammatory compound resveratrol in PKD and to investigate its underlying mechanism of action. Male Han:SPRD (Cy/+) rats with PKD were treated with 200 mg/kg/day resveratrol or vehicle by gavage for 5 weeks. Human autosomal dominant (AD) PKD cells, three-dimensional (3D) Madin-Darby canine kidney cells and zebrafish were treated with various concentrations of resveratrol or the nuclear factor B (NF-B) inhibitor QNZ. Resveratrol treatment reduced blood urea nitrogen levels and creatinine levels by 20 and 24%, respectively, and decreased two-kidney/total body weight ratio by 15% and cyst volume density by 24% in Cy/+ rats. The proliferation index and the macrophage infiltration index were reduced by 40 and 43%, respectively, in resveratrol-treated cystic kidneys. Resveratrol reduced the levels of the pro-inflammatory factors monocyte chemoattractant protein-1 (MCP-1), tumor necrosis factor-α (TNF-α) and complement factor B (CFB) in Cy/+ rat kidneys in parallel with the decreased activity of NF-B (p50/p65). The activation of NF-B and its correlation with pro-inflammatory factor expression were confirmed in human ADPKD cells and kidney tissues. Resveratrol and QNZ inhibited the expression of MCP-1, TNF-α and CFB and reduced NF-B activity in ADPKD cells. Moreover, NF-B blockage minimized the inhibition of inflammatory factor production by resveratrol treatment. Furthermore, resveratrol or QNZ inhibited cyst formation in the 3D cyst and zebrafish models. The NF-B signaling pathway is activated and partly responsible for inflammation in polycystic kidney tissues. Targeting inflammation through resveratrol could be a new strategy for PKD treatment in the future. Editor's Note: The narration and closed captions in this video are in English. For subtitles in 13 other languages, see this video on the website of the World Health Organization. Yasumitsu Hirose, M.D.Hayato Kaida, M.D. A 51-year-old man presented with fever and general malaise of 2 weeks' duration. He had had diabetes mellitus for the preceding 20 years, and at the time of presentation this condition was poorly controlled. On admission to the hospital, his white-cell count was 10,800 per cubic millimeter (normal range, 3900 to 9800). The C-reactive protein level was 8.6 mg per deciliter, blood urea nitrogen 90 mg per deciliter (32 mmol per liter), creatinine 4.9 mg per deciliter (430 μmol per liter), and glycated hemoglobin 11.2%. Abdominal radiography (Panel A) and computed tomography (Panel B) revealed gas collection in the parenchyma (arrows) and perinephric space (arrowhead) of the left kidney. The patient received a diagnosis of emphysematous pyelonephritis, possibly caused by retrograde infection related to diabetes-associated neurogenic bladder. Escherichia coli was isolated in blood culture but not in urine cultures. The patient was treated with antibiotics; the infection resolved, and renal function improved (the blood urea nitrogen level declined to 23 mg per deciliter [8 mmol per liter] and creatinine to 2.6 ml per deciliter [230 μmol per liter]). Page view data are collected daily and posted on the second day after collection. Page views include both html and pdf views of an article. 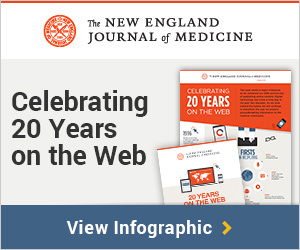 A media monitoring service searches for every mention of NEJM or New England Journal of Medicine in news stories from around the world. Radio and television mentions are predominantly from the United States, but print and web media are tracked worldwide in multiple languages. Coverage may take up to a week to appear. Comparisons to NEJM and other journal articles are to Altmetric.com data on all types of articles in all types of medical journals around the world. Social Media statistics are not yet available. SOCIAL MEDIA RANK - Altmetric.com Data. See related Challenge and other articles in the series. Accepted, unedited articles published online and citable. The final edited and typeset version of record will appear in future. Kidney injury related to paraproteinemia is common and typically occurs after the 4th decade of life in association with an underlying plasma cell dyscrasia or other lymphoproliferative disease. Kidney transplantation in paraprotein-related kidney disease can be successful in conjunction with treatment of the underlying hematopoietic process; however, when hematologic response to therapy is not achieved, recurrent kidney injury is frequently seen. We describe a young male patient who presented with end stage kidney disease at the age of 23 years thought to be secondary to focal segmental glomerulosclerosis who ultimately received two kidney allografts. He experienced recurrent proteinuria in both kidneys with a biopsy from his second allograft showing kappa-restricted crystalline light chain podocytopathy, which was identified in both his native and first allograft kidneys upon retrospective review. Recurrent light chain podocytopathy has not been previously reported but poses a diagnostic challenge as it can mimic focal segmental glomerulosclerosis, particularly in young patients where paraprotein-related kidney injury is usually not suspected. [-3.0, 11.4]). Incidence of tBPAR (19.1% vs 11.2%; P<0.05) was significantly higher, while graft loss (1.3% vs 3.9%; P<0.05) and composite of graft loss/death/lost to follow-up (6.1% vs 10.5%, P = 0.05) were significantly lower in EVR+LTac versus MMF+STac groups, respectively. Mean eGFR was similar between EVR+LTac and MMF+STac groups (63.1 [22.0] vs 63.1 [19.5] mL/min/1.73 m2) and safety was comparable. In conclusion, EVR+LTac missed non-inferiority versus MMF+STac based on the 10% non-inferiority margin. Further studies evaluating optimal immunosuppression for improved efficacy will guide appropriate dosing and target-levels of EVR and LTac in RTxRs. We, the investigators of the National Transplantation Pregnancy Registry (NTPR), read with concern King and colleagues' Pregnancy Outcomes Related to Mycophenolate Exposure in Female Kidney Transplant Recipients , based on a limited subset of our data, which concludes that first trimester exposure to mycophenolate (MPA) may not be associated with increased fetal risks. We disagree with their interpretation of the data and feel strongly that their conclusions convey false information regarding MPA safety during pregnancy. In contrast, our analysis of this data finds: (1) the significant risks to pregnancies exposed to MPA any time in the first trimester are miscarriage and phenotypic birth defects, and (2) no association between discontinuing MPA products <6 weeks preconception and the risk of graft loss at 5 years. We attribute the authors' invalid conclusions to systematic errors in assigning recipients to their comparison groups and missing information. Solid organ transplant recipients (SOTRs) are at increased risk of developing and dying from cancer. However, controversies exist around cancer screening in this population owing to reduced life expectancy and competing causes of death. This systematic review assesses the availability, quality and consistency of cancer screening recommendations in clinical practice guidelines (CPGs). We systematically searched bibliographic databases and gray literature to identify CPGs and assessed their quality using AGREE II. Recommendations were extracted along with their supporting evidence. Thirteen guidelines were included in the review. CPGs for kidney recipients were the most frequent source of screening recommendations, and recommendations for skin cancer screening were most frequently presented. Some screening recommendations differed from those for the general population, based on literature demonstrating higher cancer incidence among SOTRs versus direct evidence of screening effectiveness. Relevant stakeholders such as oncology specialists, primary care providers and public health experts were not involved in the formulation of the screening recommendations. In conclusion, although several guidelines make recommendations for cancer screening in SOTRs, the availability of cancer screening recommendations varied considerably by transplanted organ. More studies are required to inform cancer screening recommendations in SOTRs, and guideline development should involve transplant patients, oncologists and cancer screening specialists. Background: The contribution of calcineurin inhibitors (CNI) nephrotoxicity to progressive kidney transplant injury remains debated, with little long-term data from the modern tacrolimus (TAC) era using lower doses. Methods: This longitudinal cohort study evaluated histological evidence of CNI nephrotoxicity from normal donor kidneys of successful kidney-pancreas transplant recipients during cyclosporine (CSA) and TAC eras, analyzed by intention-to-treat. Results: From 200 patients, 1622 adequate prospective protocol (84.3%) and indication (15.7%) kidney biopsies yielded 8.1 ± 4.1 samples per patient, over 7.4 ± 4.4 years posttransplant. The TAC era demonstrated less rejection and reduced early immune-mediated tubular damage, compared with CSA (P < 0.001). The incidences of acute mild arteriolopathy, striped interstitial fibrosis, glomerular congestion, and tubular microcalcification were all greater with CSA (hazard ratios of 1.70, 9.35, and 3.78, respectively) and maximal within the first posttransplant year, compared with TAC-treated patients (P < 0.001). However, the 1-, 5-, and 10-year prevalence moderate arteriolar hyalinosis was similar: CSA was 5.4%, 38.4%, and 79.1%; and TAC was 4.3%, 33.6% and 77.2%, respectively (P = NS). Morphometric measurement demonstrated lumenal narrowing from inwards collapse of hyalinized arteriolar walls unable to maintain its structural integrity. Severe hyalinosis was calculated to reduce arteriolar blood flow to 20 ± 34% of normal. Severity of arteriolar hyalinosis correlated with contemporaneous glomerulosclerosis (r = 0.44, P < 0.001), and subsequent progression in 1356 sequential biopsy pairs, consistent with glomerular ischemia. Conclusions: Tacrolimus-based therapy appeared superior to the CSA era, with less early CNI nephrotoxicity and fewer rejection episodes, but comparable chronic arteriolar toxicity. Calcineurin inhibitors are imperfect long-term maintenance immunosuppressive agents because of frequent and irreversible chronic toxicity. Guidelines preferentially recommend noncalcium phosphate binders in adults with chronic kidney disease (CKD). We compare and rank phosphate-binder strategies for CKD. Tertiary hyperparathyroidism is a common cause of hypercalcemia after kidney transplant. We designed this 12-month, prospective, multicenter, open–label, randomized study to evaluate whether subtotal parathyroidectomy is more effective than cinacalcet for controlling hypercalcemia caused by persistent hyperparathyroidism after kidney transplant. Kidney allograft recipients with hypercalcemia and elevated intact parathyroid hormone (iPTH) concentration were eligible if they had received a transplant ≥6 months before the study and had an eGFR>30 ml/min per 1.73 m2. The primary end point was the proportion of patients with normocalcemia at 12 months. Secondary end points were serum iPTH concentration, serum phosphate concentration, bone mineral density, vascular calcification, renal function, patient and graft survival, and economic cost. In total, 30 patients were randomized to receive cinacalcet (n=15) or subtotal parathyroidectomy (n=15). At 12 months, ten of 15 patients in the cinacalcet group and 15 of 15 patients in the parathyroidectomy group (P=0.04) achieved normocalcemia. Normalization of serum phosphate concentration occurred in almost all patients. Subtotal parathyroidectomy induced greater reduction of iPTH and associated with a significant increase in femoral neck bone mineral density; vascular calcification remained unchanged in both groups. The most frequent adverse events were digestive intolerance in the cinacalcet group and hypocalcemia in the parathyroidectomy group. Surgery would be more cost effective than cinacalcet if cinacalcet duration reached 14 months. All patients were alive with a functioning graft at the end of follow-up. In conclusion, subtotal parathyroidectomy was superior to cinacalcet in controlling hypercalcemia in these patients with kidney transplants and persistent hyperparathyroidism. ¿Qué pasa con las IPS en Colombia? Impact of early blood transfusion after kidney transplantation on the incidence of donor-specific anti-HLA antibodies. AJT Impact of early blood transfusion after kidney transplantation on the incidence of donor-specific anti-HLA antibodies. Ferrandiz I, Congy-Jolivet N, Del Bello A, et al. Am J Transplant 2016 Mar 21. Little is known about the impact of post-transplant blood transfusion on the sensitization of anti-HLA antibodies and the formation of donor-specific antibodies (DSAs). The aims of our study were to determine the 1-year incidence of DSAs (assessed using a solid-phase assay) and antibody-mediated rejection (AMR) in kidney-transplant patients who had or had not received a blood transfusion during the first year post-transplantation. Included were 390 non-HLA sensitized patients who had received an ABO-compatible kidney transplant, and had not previously or simultaneously received a non-kidney transplant. Sixty-four percent of patients received a red blood-cell transfusion within the first year post-transplantation, mostly within the first month. The overall 1-year incidence of DSAs was significantly higher in patients that had undergone transfusion (7.2% vs. 0.7% in patients with no transfusion, p<0.0001). AMR occurred more often in the transfusion group (n=15, 6%) compared to the non-transfusion group (n=2, 1.4%), p=0.04. Blood transfusion was an independent predictive factor for de novo DSA formation but not for AMR. Patients who had a transfusion and developed DSAs were more often treated with cyclosporin A (n=10, 55.5%) rather than tacrolimus (n=45, 19.4%), p=0.0001). In conclusion, early post-transplant blood transfusion may increase immunological risk, especially in under-immunosuppressed patients. This article is protected by copyright. All rights reserved. Background: There is some evidence pointing toward better renal function in kidney transplant recipients (KTR) treated with once-daily tacrolimus (QD-TAC) vs. twice-daily tacrolimus (BID-TAC). Methods: This is an extension study of a 1-year, single arm prospective study of stable KTR who were converted from BID-TAC to QD-TAC (4.9 ± 4.0 years after transplantation) in Spanish routine clinical practice. Patient and graft survival, renal function, acute rejection episodes, and other analytic parameters were assessed at 24 and 36 months after conversion. Results: A total of 1798 KTR were included in the extension study. Tacrolimus doses at 36 months were significantly lower compared to those at time of conversion (−0.2 mg/day; P = 0.023). Blood levels were lower than baseline during all the study (P < 0.001). Graft and patient survival at 3 years after conversion were 93.9% and 95.1%, respectively. Compared with baseline, the mean estimated glomerular filtration rate (eGFR) remained very stable at all timepoints (56.7 ± 19.8 vs 58.1 ± 24.6 mL/min per 1.73 m2 at month 36; P = 0.623). Even when patients reinitiating dialysis were counted as eGFR = 0, the mean eGFR was very stable. In fact, a small but significant increase was observed at 36 months versus baseline (+0.1 mL/min per 1.73 m2; P = 0.025). An increase in proteinuria was observed at 36 months versus baseline (+0.11 g/24 h; P < 0.001). Acute rejection rates were low during the study. Conclusions: Conversion from BID-TAC to QD-TAC in a large cohort of stable KTR was safe and associated with a very stable renal function after 3 years. Comparative studies are warranted to assess the feasibility of such conversion. Background: Native nephrectomy (NNx) is often done in patients with autosomal-dominant polycystic kidney disease. Controversy exists concerning the need and timing of nephrectomy in transplant candidates. We hypothesize that posttransplant NNx does not negatively impact patient and graft survival. Methods: Among 470 autosomal-dominant polycystic kidney disease transplant recipients included in the study, 114 (24.3%) underwent pretransplant (30.7%) or posttransplant (69.3%) NNx. Clinical data were retrieved from electronic records. Follow-up was until death, graft loss or June 2014. Perioperative complications were compared between the surgical techniques (open or laparoscopic) and between the pretransplant and posttransplant nephrectomy groups. The effect of nephrectomy on graft survival was analyzed as a time-dependent covariate when performed posttransplant. Results: Mean age at transplant was 52.4 years, 53.8% were men, 93% white, 70% were from living donors, and 56.8% were preemptive. Nephrectomy was done laparoscopically in 31% and 86% in the pretransplant and posttransplant nephrectomy groups, respectively. Complications were less common in those who underwent nephrectomy posttransplant (26.6% vs 48%, P = 0.03) but were similar regardless of surgical technique (open, 33.3% vs laparoscopic, 33%; P = 0.66). Patient and graft survivals were similar between those who underwent pretransplant nephrectomy and the rest of the recipients. In the posttransplant nephrectomy group, nephrectomy did not affect patient (hazards ratio, 0.77; 95% confidence interval, 0.38-1.54; P = 0.45) or graft survival (hazards ratio, 1.0; 95% confidence interval, 0.57-1.76; P = 0.1). Conclusions: Nephrectomy does not adversely affect patient or graft survival. Posttransplant nephrectomy is feasible when indicated without compromising long-term graft outcome and has fewer complications than pretransplant nephrectomy. Abstract: Posttransplant lymphoproliferative disease (PTLD) is a potentially fatal complication after (solid organ) transplantation, which is highly associated with Epstein-Barr virus (EBV). The EBV-specific cytotoxic T cell response that is essential in controlling the virus in healthy individuals is suppressed in transplant recipients using immunosuppressive drugs. A primary EBV infection in EBV-seronegative patients receiving an EBV-seropositive donor organ or a reactivation in those who are already latently infected pretransplantation can lead to uninhibited growth of EBV-infected B cells and subsequently to PTLD. Effective preventive strategies, such as vaccines and antiviral agents, are lacking. Because not every transplant recipient with increasing EBV viral load develops PTLD, it is hard to decide how intensively these patients should be monitored and how and when a preemptive intervention should take place. There is a need for other tools to help predict the development of PTLD in patients at risk to make timing and strategy of preemptive intervention easier and more reliable. The cornerstone of the treatment of patients with PTLD is restoring the host's immunity by reduction of immunosuppressive drug therapy. American and British guidelines recommend to add rituximab monotherapy or rituximab in combination with cyclophosphamide, doxorubicin, vincristine, and prednisolone, depending on histology and clinical characteristics. Although response to these therapies is good, toxicity is a problem, and PTLD still has a relatively high mortality rate. An evolving therapy, especially in PTLD occurring in allogeneic stem cell transplantation, is restoring the host's immune response with infusion of EBV-specific cytotoxic T cells. This may also play a role in the future in both prevention and treatment of PTLD in SOT. Long-term Follow-up of Kidney Transplant Recipients in the Spare-the-Nephron-Trial. Transplantation - Published Ahead-of-Print Long-term Follow-up of Kidney Transplant Recipients in the Spare-the-Nephron-Trial. In the Spare-the-Nephron (STN) Study, kidney transplant recipients randomized about 115 days posttransplant to convert from CNI (calcineurin inhibitor)/MMF to sirolimus (SRL)/MMF had a significantly greater improvement in measured GFR (mGFR) at 12 months compared with those kept on CNI/MMF. The difference at 24 months was not statistically significant. From 14 top enrolling centers, 128 of 175 patients identified with a functioning graft at 2 years consented to enroll in an observational, noninterventional extension study to collect retrospectively and prospectively annual follow-up data for the interval since baseline (completion of the parent STN study at 24 months posttransplant). Overall, 11 patients died, including 5 (7.6%) in the SRL/MMF group and 6 (9.7%) in the CNI/MMF group. Twenty-two grafts have been lost including 10 (15.2%) in the SRL/MMF arm and 12 (19.4%) in the CNI/MMF arm. Death and chronic rejection were the most common causes of graft loss in both arms. There were modestly more cardiovascular events in the MMF/SRL group. Estimated creatinine clearance (Cockcroft-Gault) from baseline out to 6 additional years (8 years posttransplant, ITT analysis, SRL/MMF, n = 34; CNI/MMF, n = 26) was 63.2 +/- 28.5 mL/min/1.73 m2 in the SRL/MMF group and 59.2 +/- 27.2 mL/min/1.73 m2 in the CNI/MMF group and was not statistically significant, but there is a clinically meaningful trend for improved long-term renal function in the SRL/MMF group compared with the CNI/MMF group. The long-term decision for immunosuppression needs to be carefully individualized. Copyright (C) 2016 Wolters Kluwer Health, Inc. All rights reserved. We retrospectively analyzed risk factors for CMV infection in 348 patients who received a kidney transplant donated after brain death (n = 232) or by living donation (n = 116) between 2008 and 2013. Of the 348 patients analyzed, 91 received a mammalian target of rapamycin inhibitor (mTORi)-based immunosuppressive regimen. A total of 266 patients were treated with standard immunosuppression (Group 1) consisting of basiliximab induction, calcineurin inhibitor (CNI), and either mycophenolic acid (MPA, n = 219) or everolimus (EVE) (n = 47). We also included 82 patients who received more intense immunosuppression (Group 2) with lymphocyte depletion, CNI, plus either MPA (n = 38) or EVE (n = 44). Only patients in the high-risk constellation received CMV prophylaxis in Group 1, while all patients in Group 2 received prophylaxis for 6 month. The overall rate of CMV infections was low with 10.1% in all patients. Despite the different prophylaxis strategies applied, no difference was seen in CMV infections between Group 1 (10.9%) and Group 2 (13.6%). A multivariate analysis revealed that patients on EVE had fewer CMV complications compared with patients on MPA (P = 0.013, odds ratio [OR] 4.8, confidence interval [CI] 1.4–16.5). Donor and recipient age >65 years was an independent risk factor (P = 0.002, OR 3.2, CI 1.5–6.7) for CMV infections. Patients with CMV infections had significantly worse graft function after 2 years (P = 0.001).